It is a element that helps to satisfy all visitor and search engine needs and achieve rank positions in the search. By the use of a SEO-friendly digital product, you will have the foundation to establish a visible net project that will be easy-to-find through the standard keywords research. And additionally, you can make your web site achieve greater rankings in search results, as a result making it much more likely that people will take a look at it. Portfolio website is a kind of website that lets exhibiting different items (services, artworks, products, and so on). It serves as a self-sufficient means of marketing. Any site visitor can see your works and projects. It is possible to attract potential customers and function without intermediaries - clients on their own should come to you. WPML-ready WordPress web templates offer the flexibility to convert posts, meta tags, categories, and many others in a range of spoken languages. This really makes your website articles and other content quicker to understand for international purchasers. Responsive design renders an online page very same properly on any sort of display screen size. It doesn't matter what kind of device your clients can work with to enter the web page - they will certainly discover a vivid picture with a simple navigation menu. It is deemed an especially necessary feature, taking into account that the majority of internet consumers these days favor their cell phones for web surfing. Is it reasonable to make unique purchase of WordPress design for Society & People that was already purchased before? Yes, it's reasonable to make a unique purchase of WordPress design for Society & People. Because there is very small chance that you will find the same design on the net. There are more than 3,000,000,000 webpages online now according to statistics on www.google.com. Can I customize the Society & People Services WP theme if that's required by application settings? Yes, you can customize the Society & People Services WP theme code, graphics, fonts to any extent needed. What is Developers License for Society & People Support WP template? If you purchase a Developer's license, you are granted a non-exclusive permission to use the Society & People Support WP template on up to 5 domains for projects belonging to either you or your client. Can I use graphics from Society WP template I purchased for use in printing? Yes, it's not prohibited to use the Society WP template graphics for printed material, but the resolution of the templates graphics ( except for logo templates) is not enough for printing. What am I allowed and not allowed to do with the Society WordPress design themes? You may: Build a website using the Society & People WP template in any way you like.You may not:Resell or redistribute templates (like we do).Claim intellectual or exclusive ownership to any of our products, modified or unmodified. All products are property of content providing companies and individuals.Make more than one project using the same template (you have to purchase the same template once more in order to make another project with the same design). Are your WordPress design themes for Society & Peoplecompatible with any CMS? Can I put a line at the bottom ( or any other spot) of the customized Society WP template "Website design by Company name"? No, you cannot place a line at the bottom ( or any other spot) of the customized Society WP template saying "Website design by Company name". Nevertheless, you can place "Customized by Company name". What is a unique purchase license for Society WP template? If you purchase the product at a â€˜Unique price' it guarantees that you are the first and the last person to buy this Society WP template from us. It means that this template has not been sold before and you become an owner of a unique design. After this kind of purchase the template is being permanently removed from our sales directory and is never available to other customers again. The unique purchase license allows you to develop the unlimited number of projects based on this template, but the template should be customized differently for every project. Can I resell WP templates for Society I bought the developers license for? You cannot resell the customized Society & People Services WP theme as a template, but you may sell it as a project to your client. What is Extended License for WordPress design theme for Society? Is it possible that Template Monster will contact my client which website I made from Template Monster's website WP template for Society & People Support? Yes, our legal department checks licenses regularly. In case we won't find designer's contact information on the site which was made from the WP template for Society & People Support of ours we will contact the owner of the site directly. What is the difference between unique and non-unique Society & People WP template purchase? Non-unique purchase:Non-exclusive purchase means that other people can buy the Society & People WP template you have chosen some time later.Unique purchase:Exclusive purchase guarantees that you are the last person to buy this template. After an exclusive purchase occurs the template is being permanently removed from the sales directory and will never be available to other customers again. Only you and people who bought the template before you will own it. Can I put a line at the bottom (or any other spot) of my new product "Website development by Company name" after purchasing Society & People Services WP theme? Yes, you can place a note at the bottom (or any other spot) of my product "Website development by Company name". Nevertheless, you cannot place "Website design by Company name"while using one of Society & People Services WP theme. How many applications, programs etc can I use to integrate with the WordPress design themes for Society & People under one extended license? The extended license gives you the right to use the purchased WordPress design themes for Society & People for the integration with one software/freeware/application/CMS/sitebuilder only. In case you would like to use the template with the other application, the other license is to be acquired. Are there any discounts if I'm buying over 10, 20, 30 or more Society WP template? Please email to marketing@templatemonster.com with your inquiries about WordPress design themes for Society & People Services. I ordered a Society WP template but haven't received the download information. In case of not receiving the download information of a Society WP template, please contact our Billing Department via support chat by phone or e-mail. Can I resell the WP template for Society & People Support as is? No, you cannot resell the WP template for Society & People Support as is. Is it possible to buy the particular image from the WordPress design for Society & People? What do I receive when I order a WordPress design theme for Society from TemplateMonster.com? After you complete the payment via our secure form you will receive the instructions for downloading the WordPress design theme for Society. The source files in the download package can vary based on the type of the product you have purchased.If you need unzipping software to open the .zip archive, Windows users may visit www.WinZip.com, Mac users may visit www.StuffIt.com. Is there any return policy for Society WordPress design themes? Requests for a refund are accepted at www.template-help.com/tickets within the period of 2 weeks after the order of Society WP template is placed. You should accompany this request with detailed and grounded reasons why you apply for a refund. Please make sure your request does not contradict the terms and conditions specified in the policy. A refund is issued to you upon receipt of a Waiver of Copyright signed by you. Can I apply a discount code to a discounted Society & People Support WP template or combine several discount codes together to get better price? Can I get the extended license for some other pricing than the half of the initial WordPress design theme for Society price? No. The price for purchasing license for a single WordPress design theme for Society is the half of the template unique price. The World of Charity theme is great for what I need it for. Clean and simple, not cluttered at all. I am still working with it so I still have things to learn, but so far so good. Adjustable font, heading size and colour scheme. Great thank you. 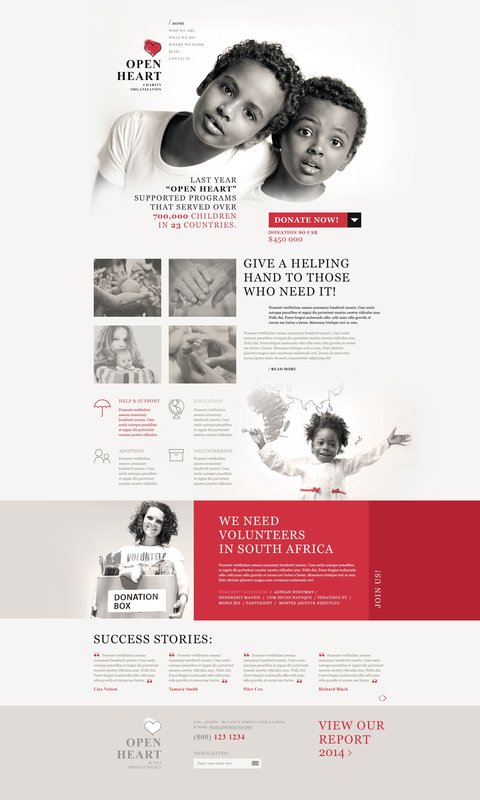 Bought the theme for my humanitarian blog, good for SEO, Light...love it. Very Nice Script and compatibility. It matched to my client requirement almost 80%. We wanted a theme that fit the requirements for an institution that takes care of special people and this theme was perfect. We need not change a lot to get a very good result for this client, as you can see the theme combines with the institution. The installation took place smoothly, feed the site with the information and we customized little in CSS, we had setbacks at this stage. Unfortunately we will not be able to pass a previous link because the site is in its final stage of correction and adjustment of some text and images. Above all we would like to again thank Template Monsters, as always when you need support they are ready to help us.